The Community and Vocational Services Committee raises awareness of the wider work of Rotary within the local community and organises local projects. Currently this Committee is working with Hope for Tomorrow to promote the charity and to raise funds towards the operation of the charity in and around Gloucestershire. The Committee have also provided help with stewarding at the Advent Festival for Cirencester Town Council. We are currently exploring ways of working with the Town Council, Gloucestershire Highways and Gloucestershire County Council to improve the appearance of the roundabouts on the approaches to Cirencester. In April we hosted a "Know your Blood Pressure Day" in common with other Rotary Clubs throughout and . This encouraged people to focus on the need to be aware of their blood pressure as an indicator of good or poor health. As a contribution to the forthcoming Town Centre improvements we have donated a self-watering planter for the triangular area where meets . A long - term project based at Whelford Pools near Fairford involves our members who assist Gloucestershire Wildlife Trust with environmental and conservation work around the lakes. It's a great day out once a month, with the satisfaction of seeing that we have made a difference at the end of the day. 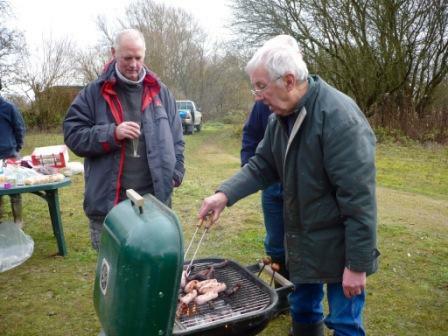 The Christmas BBQ is also not to be missed! We are planning a Car Treasure Hunt for members in June, and a Biathlon for local primary schoolchildren involving a run and swim. We are also working closely with Inner Wheel, Round Table and other local organisations to promote our work with the community to benefit local people.